TiVO systems are just the latest incarnation of programmable systems for recording television programs for playback at a later time. In 1972, Sears, Roebuck & Company announced "plans to market the first integrated videotape cartridge recording-playback unit for the home." It was part of a package that included a specially designed 25" color TV, a camera, and a recording / playback unit. The projected price of $1,600 is equivalent to $9,435 in 2017 money*. As always, it was the early adopter technophiles who financed the engineering and market research that eventually led to the sub-$1,000 monster LED TVs and $200 TiVO units of today. Earned engineering degrees had leveled off in numbers by 1971, with a grand total of 43,167 Bachelor's degrees, primarily electrical engineering. The American Society for Engineering Education (ASEE) reports that 106,658 Bachelor degrees in engineering were awarded in the U.S. in 2015. That represents a 147% increase over 45 years. The U.S. population has increased by 155% in the same time, so that's about right. Also in the news was Tandy's takeover of Allied Radio stores, which we know disappeared many moons ago just as the last vestiges of Radio Shack are now disappearing. Allied Electronics is still going strong, thankfully. I have to admit that I have never owned or operated a TiVO unit, primarily because I do not watch TV. * Bureau of Labor Statistics' (BLS) Consumer Price Index (CPI) Inflation Calculator. At a recent press showing, Sears Roebuck announced plans to market the first integrated videotape cartridge recording-playback unit for the home. The system includes a 25-in. color TV console, which houses the videotape deck, and a lightweight black and white camera. The unit will go on sale in the Chicago area for $1600. TV programs can be taped in color off the air and prerecorded tape cartridges can be played back in color. Cartridges, either blank or prerecorded, will sell for $13 to $40, depending on length and content. The longest tapes offer programs up to 114 minutes. Full-length motion picture tapes can be rented for about $6 for a single showing (tape cannot be rewound by the user). 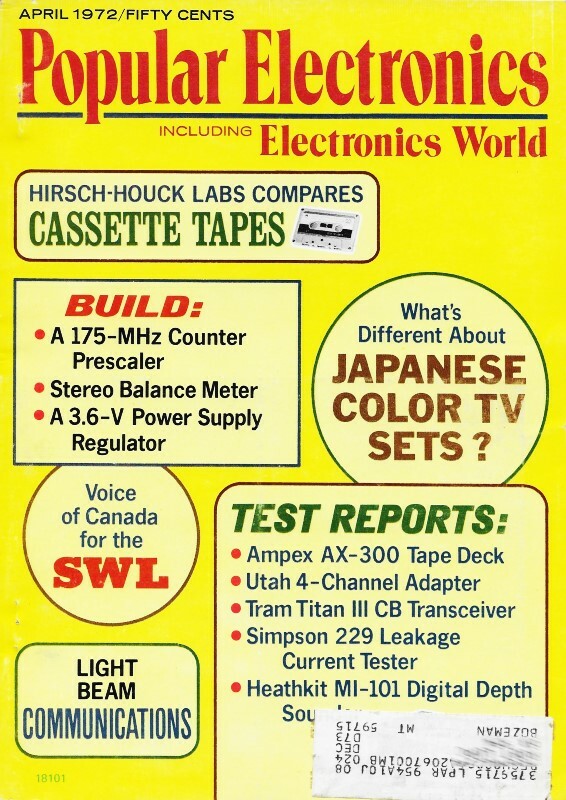 The tape deck is made for Sears by Avco and uses the company's Cartrivision system. A portable color TV camera is in the works and is expected to sell for around $400. 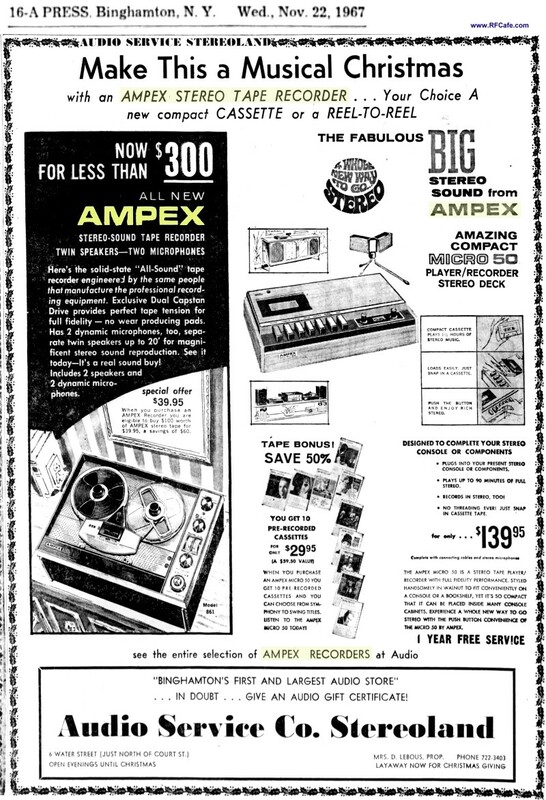 Because of inadequate profits, Ampex is discontinuing operation of its consumer equipment division. The division markets tape recorders for the consumer. The company will continue to sell prerecorded and blank tape and will honor warranties and provide parts for its products. The division represented only about 5 percent of the company's corporate sales last year. About 200 people were with the division; their jobs will be gradually phased out or they will be offered other positions with the company. Cassette sales will rise 18 percent to about $330 million in 1972 according to a prediction by Edward Smulders, manager of Norelco Cassette Dept. The increase will be aided by increased distribution through supermarkets and drug stores. More than 142 million blank and prerecorded cassettes will be sold next year, Mr. Smulders said, compared to an anticipated total for 1971 of 120 million units valued at $280 million. It is said that there are more than 16 million cassette recorders in the U.S. - one for every four households. SSperry Rand and RCA have signed a final agreement under which Sperry will acquire RCA's customer base in general purpose computers. Under the terms of the agreement, Sperry Rand's Univac Div. will, starting January 1, provide software and hardware maintenance and systems support to RCA's former computer customers in U.S., Canada, and Mexico. These include more than 500 users with more than 1000 computers installed. The Tandy Corp. has agreed to sell 36 Allied Radio stores it acquired last year when it took over the Allied Radio Corp. A civil antitrust suit was brought against the company last year, and this agreement was contained in a proposed consent judgment filed in the U.S. District Court in Chicago to settle the suit. If approved by the court, the proposal would become effective within 30 days. Tandy would then sell 36 Allied Radio stores in Illinois, Indiana, Michigan, Minnesota, Missouri, Wisconsin, and Texas. The government had charged that the takeover eliminates competition among electronic parts dealers engaged in retail over-the-counter and mail-order sales to hobbyists. A U.S. patent has been issued to Peter Scheiber of Audiodata Co. covering encoding and decoding matrix techniques for four-channel recording and broadcasting. Scheiber and Electro-Voice had previously agreed to pool their efforts in the protection of patents, licensing, and manufacture of equipment using developments from both films. E-V's technical director, Howard Durbin, stated that it is the company's belief that the patent is basic and will cover all current or announced matrixing systems. The company is continuing development of their Stereo-4 system (in conjunction with Leonard Feldman and Jon Fixler) which they describe as the first production matrix technique on the market. According to preliminary Electronic Industries Association statistics, consumer electronics sales in 1971 will exceed $5 billion at the manufacturing level including imports, or $8 billion at retail. This total market includes the sales of television, radio, phonograph, and tape equipment as well as such items as electronic musical instruments, transceivers, hearing aids, and home intercoms. Television, the industry's major product category, will have a record year in both units and dollar volume. Domestic manufacturer sales and foreign imports will exceed 14 million units - 7 million in color and 7 million in black and white - for a total estimated sales volume of over $3 billion. In addition to the 14 million TV sales, radios will reach 45 million units, phonographs 6 million, and tape equipment 15 million units. Skylab, our manned earth orbital space laboratory to be launched in 1973, will carry some experiments designed by high school students. More than 15,000 applications for participation have been requested of the National Science Teachers Association, which is managing the activity for NASA. Entries consist of proposals by students for experiments, demonstrations, or activities to be performed by the astronauts. Deadline for the proposals to be submitted to the chairmen of one of 12 regions was Feb. 4, 1972. Regional winners will be judged by a national committee and 25 national selectees will be forwarded to NASA. Final selection will be made from the national selectees on the basis of compatibility with Skylab requirements. The number of engineering degrees conferred by the 277 U.S. engineering schools during the year that ended in June 1971 was only slightly more than for the previous year, according to a report released by the Engineering Manpower Commission of the Engineers Joint Council. There were 43,167 bachelor's degrees, only 201 more than last year. At the master's level, where the increase over 1970 was largest, 16,383 degrees were awarded this year compared to 15,548 for the previous 12-month period. Doctor's degrees in engineering, at 3640, barely exceeded last year's 3620. At both advanced degree levels this year's totals were the largest ever recorded. The major field of study, amounting to about a quarter of the total figures, was electrical engineering.